For those facing criminal charges or on probation, finding and accessing resources for help can be difficult. Five years ago, Family & Children’s Service (F&CS) formed the Women’s Justice Team (WJT) to help address these critical issues. The initiative began when Chief Program Officer for Women in Recovery (WIR) Mimi Tarrasch and Senior Program Officer at the George Kaiser Family Foundation (GKFF) Amy Santee wanted to better understand some of the hidden reasons for the high female incarceration rates in Oklahoma. While the number of Tulsa County women going to prison were declining, the female incarceration rate was still high. 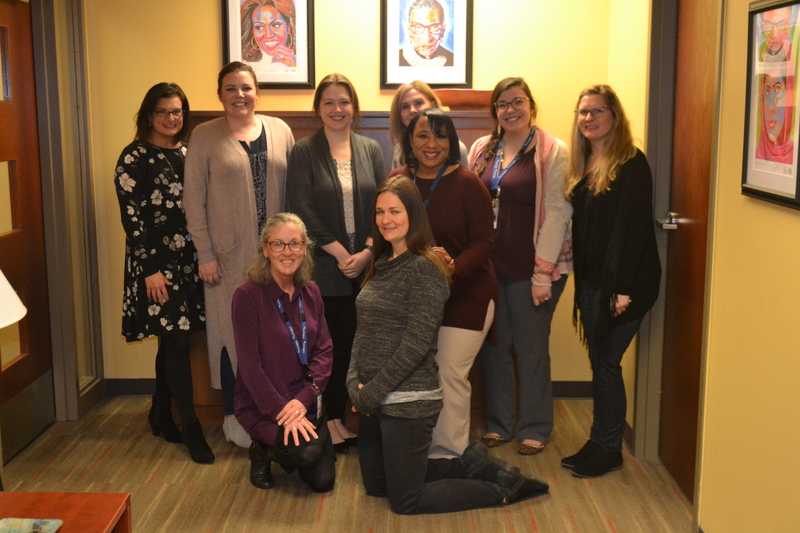 Stephanie Horten, a former criminal defense attorney, and Elizabeth Hocker, a former assistant district attorney with the Tulsa County District Attorney’s office, collaborated with GKFF to conduct research on the women being sentenced by the Department of Corrections (DOC). For one year, they researched every single woman who went to prison and reviewed charges, prior convictions, attorneys, judges, probation violations and any diversion opportunities. They also reviewed all women arraigned in the Tulsa County courthouse within that same time period in order to fully understand the scope of women’s experiences within the criminal justice system in Tulsa County. According to Horten, “What we found from the women who went to prison was that there were so many that had low-level, non-violent offenses. They were given several opportunities, but they just had a hard time getting out of the system. It had been a really long journey, and they ended up being sentenced to prison. It made us think ‘What if we could intervene early on?’” Horten also explained that when they looked at all of the women who had been arraigned on new charges, that about 70 percent of them did not have a prior felony conviction. At that time, women without a prior felony conviction did not qualify for and were not offered any court-ordered services or treatment. It was for this reason that the WJT was developed. “WJT helps women new to the criminal justice system. The goal is to meet with women early on to see what they need. And the services offered are voluntary so that there is not an additional requirement or obligation that has to be fulfilled in order for women to successfully exit the criminal justice system,” Horten said. The WJT helps women with whatever they need – linkage to community resources, assistance with basic needs, bus passes, substance abuse treatment and therapy, just to name a few. The goal is to provide each woman with whatever it is she needs in order to successfully exit the criminal justice system and be productive members of their communities. Current WJT Director Jena Moore joined the team after Horten became the director of the Criminal Justice Collaborative (a group of criminal justice stakeholders who meet to collaborate, identify gaps and work towards system improvements within the criminal justice system). “We help women access inpatient treatment; we do a lot of community outpatient therapy for substance abuse and mental health. We provide case management, referrals and support for children’s services, resources for housing … anything they need in the Tulsa area,” Moore said. Over the last year, the WJT has expanded to include a new case manager and part-time employment specialist to help clients needing jobs. “It is certainly great to have an employment specialist onboard because finding a job with a criminal history or even pending charges can be difficult,” Moore said. “What we know now is that when a woman goes to jail, it can change the entire trajectory of the family. The gaps that we fill for employment, housing, therapy, getting medication, basic needs – I don’t think anyone fathoms that when you get out of jail, you don’t have the essentials. It is so hard to get around for a job interview, for court … just remembering everything. We’ve also started working with both the District Attorney’s (DA) supervision and DOC probation, partnering to help women avoid being arrested for violating their probation.” Moore said the team obtains a daily list of women that are placed on DA supervision or court costs/fines and fees to begin early intervention. In addition to connecting women to resources and providing therapy and substance abuse treatment as needed, the WJT also goes to court with clients because navigating the justice system can be very difficult, daunting and confusing. “A lot of women are alone at this point. The WJT helps them understand where to go, where they need to make payments (sometimes they make payments at one place, but then must go to another place to pay more fees), etc. It’s a confusing system. Being a court advocate doesn’t always mean intervening in court procedures, but to simply sit and be a presence with the client in the criminal justice system,” Moore said. While both the WJT and WIR work with justice-involved women, the programs look very different and the women they serve are at different places within the criminal justice system. WIR is intensive and is a last resort for women who are otherwise facing prison time, while the WJT is voluntary and offers help for women new to the system who don’t qualify for any other court-ordered diversion opportunity. “We are sort of the bookends of the criminal justice system, which is intentional to fill both of those gaps,” Horten said.